I finally moved into the 21 century music world. I acquired a Bose Sound Touch 30 and subscribed to Spotify Premium. Wow, there are a lot albums, songs on this site. And you can save them to your smart phone and play back in your auto without wasting cell data. I know this technology has been out for a while, but sometimes it takes me a bit of time to catch on (still not on Twitter). Anyway......I wanted to hear some Neil Diamond and, holy @#^%, he made a bunch of albums. I ended up listening to the entire Tap Root Manuscript album. Such dramatic music. I forgot just how powerful that guy's voice is. I've been a fan since his first "Just For You" album. Prolific songwriter, great singer. Over the years we've seen him several times in concert and he always put on a great show. I used to work in a big music store in Los Angeles, and Neil Diamond was scheduled to perform a live in-store to promote his (then) new album Tennessee Moon. I came in to work on the day of the in-store, totally forgetting what was supposed to be happening that day. He arrived a few hours early to do a quick soundcheck. All I knew, in that moment, was that as I walked in the door, I saw Neil Diamond standing in the middle of the store with an acoustic guitar, belting out "Cherry Cherry". For a good 10 seconds, I was bugging out, wondering what on earth was going on. It almost an "Am I on another planet?" moment. Then I remembered what was happening. 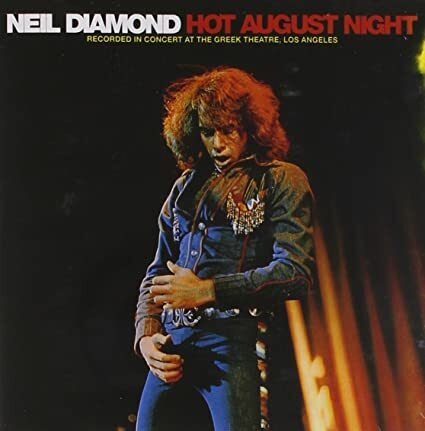 I talked the sound guy into letting me plug my DAT recorder into his soundboard near the end of the performance, and ended up with a good recording of Neil singing "Cherry Cherry" which I still have to this day. For 10 seconds though, when I walked into work, and first saw him singing with an acoustic guitar, it was quite surreal. I have always been a Neil Diamond fan. I have many of his songs in my iTunes library. I love his voice, and had a huge crush on him back in the day. He was ADORABLE. Liked him in the early years, hated him in the later years... "You don't send me flowers" "Pretty in Blue Jeans" Bleeech! Cracklin' Rosie is a long time favorite of mine, what a great songwriter. I grew up as a musician in Nashville, and the city is absolutely loaded with entertainers and singers. The most incredible talents we'd see walking down the street. One of Nashville's nicknames is "The Third Coast" for all the ex-Los Angeles people living there for the cheaper living. They also stay out of trouble while living in an artistic place. Neil Diamond's are a dime a dozen there. He's a great songwriter--for sure. My Mom was a fan back in the 70s. For her 70th birthday, I took her to a Neil Diamond tribute band concert in a small venue. Wow. Now that is a GREAT story. Oh, how I wish that had happened to me!